Born to the Italian nobility who grew up in a castle, the son of Ferdinand Gonzaga, a prince in the Holy Roman Emperor and a compulsive gambler. Cousin of Saint Rudolph Acquaviva. Trained from age four as a soldier and courtier. Served as a page in the Spanish court. He suffered from kidney disease, which he considered a blessing as it left him bed-ridden with time for prayer. While still a boy himself, he taught catechism to poor boys. He received his First Communion from Saint Charles Borromeo. At age 18, Aloysius signed away his legal claim to his family's lands and title to his brother, and became a Jesuit novice. Spiritual student of Saint Robert Bellarmine. Tended plague victims in Rome, Italy in the outbreak of 1591 during which he caught the disease that killed him at age 23. Leper mentioned by Christ in the parable of Lazarus and the rich man in the Gospel of Luke (see below). The Order of Saint Lazarus was founded in the 12th century to provide nursing for lepers, taking Lazarus as its patron. The knights of the order were lepers, and besides helping their fellow sufferers, they carried out military duties. They founded a hospital for lepers near the northern wall of Jerusalem. Seminarian at Guadalajara, Mexico. Parish priest at Zapotlanejo, Jalisco, Mexico in 1900. Strong and gentle father to his flock, he refused to abandon his parish during the persecutions of the Church by the government; he went into hiding, and ministered covertly to his parishioners. 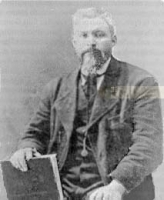 The mayor of Zapotlanjejo, Jose Orozco, was virulently anti-Catholic, and offered a reward for the capture of any priest. Father Jose was betrayed for this reward, and arrested; his Judas was Nemesio Bermejo, an ex-seminarian who lived with Flores. Flores was offered his freedom if he would accept the anti-Church Calles government; he declined. Orozco turned the Zapotlanejo rectory into a jail, threw Flores into it, gave him no food or water for three days, played music outside the gaol so he could not sleep, and repeatedly offered him freedom in exchange for cooperation; Father Jose declined. On the night he died, Jose was taken to a nearby cemetery, and tortured by being repeatedly hanged in a tree, but being lowered before he died. One of the soldiers, who had been baptized by Father Flores, refused to participate in the torture; the others shot him. They then took the padre's few possessions and murdered him. The squad tried to shoot him, but their guns would not fire, and the troop's commander, Anastasio Valdivia, cut Flores' throat. Martyr. Lancashire gentleman. Raised Protestant but converted to Catholicism. Converted others, including his father. Imprisoned at Newgate for his faith, and for refusing to acknowledge the Queen as head of the Church. Did time with Saint John Jones. Tortured and executed by order of Justice Guady for refusing to attend Protestant services. One of the Forty Martyrs of England and Wales. As part of the paperwork before his execution, he was asked his marital status. John replied he was "both a bachelor and a maid," the latter apparently referring to his job as a servant in the household of the avid Protestant Sir Edmund Heddleston. Born to the nobility of Évreux, France. 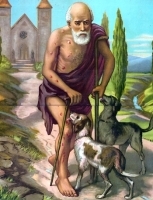 Brother of Saint Agofredus. Studied at Condat and Chartres in France. Teacher of young boys at Evreux, France. Spiritual student of Saint Sidonius of Saint-Saens. Benedictine hermit at Cailly and at Rouen in France. Founded La Croix-Saint-Ouen abbey (later called Saint-Leufroy in his honour) c.690, and served as its first abbot. Legend says that he used prayer to extinguish a fire that threatened to destroy his monastery. Augustinian canon regular at the monastery of Saint-Antonin de Frédélas in Pamiers, France. Prior of the monastery of Saint-Sernin in Toulouse, France. Bishop of Barbastro, Aragon, Spain in 1104. Very active in his diocese, constantly travelling to visit parishes, caring for his priests, encouraging the faith in the laity, living simply and giving charity lavishly. Exiled by force from 1116 to 1119 for preaching aginst the use of Christian armies against the foes of Christendom. Born to the nobility. During a feast, Nicholas became drunk, then beligerent, and then beat up a guest. Knowing the punishment that would follow, he hid and when he thought he had been found, he pleaded for mercy and promised repentance; he then looked up to see that he had been found by a vision of Saint Norbert of Xanten who protected Nicholas by wrapping him in his cloak. Accepting the vision, Nicholas joined the Norbertines and made his vows in 1628. Canon on the Stahov monastery just outside Prague, Bohemia (in the modern Czech Republic). Novice master. Noted preacher and orator who would speak at two churches each day to large crowds. Prior of his monastery. Developed a great devotion to the Blessed Virgin Mary. Dean of the convent at Doksany in 1649. Priest. Worked with Saint Ursus. The two fled Naxos, Greece to Naples, Italy to escape Arian persecution. Saint Ambrose of Milan sent them on to Gaul and Germany to evangelize the pagans there. Ursus was killed on the way, but Alban continued to Mainz, Germany. He became famous as a preacher, converting many, and opposing Arianism. Martyred by invading Vandals. Priest in the diocese of Poitiers, France. Imprisoned on a ship in the harbor of Rochefort, France and left to die during the anti-Catholic persecutions of the French Revolution. One of the Martyrs of the Hulks of Rochefort. Born to the French royal family, the son of the count of Cahors and lord of Turenne. Ralph gave up his worldly position to become a monk in 822. Archbishop of Bourges, France in 840. Founded seven monasteries and worked tirelessly to improve discipline and encourage the faith. Compiled the book Pastoral Instructions to guide the priests of his diocese. Followed Saint Samson from Wales to Brittany in the sixth century, accompanied by his godson Saint Austell of Cornwall. Evangelized the Broceliande district. Founded the monastery at Parmpont, Brittany, France that was later named for him. 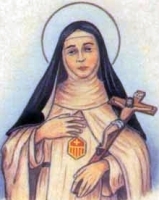 Daughter of Saint Flavian and Saint Dafrosa; sister of Saint Bibiana. Following the martyrdom of her parents during the persecutions of Julian the Apostate, Demetria was arrested with Bibiana; she dropped dead before reaching her cell. Martyr. Mercedarian friar at the convent of Saint Eulalia in Seville, Spain. Became a Benedictine monk at a very early age. Priest. Abbot. Missionary to Friesland, working with Saint Willibrord of Echternach. Mercedarian nun, one of the first. Great spiritual teacher to her sisters. Miracle worker. Eighth century bishop of Armagh, Ireland for 12 to 15 years (records very). 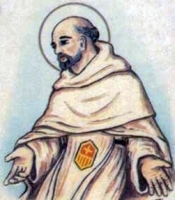 Mercedarian friar and preacher who ransomed Christians enslaved by Muslims in North Africa. Bishop of Pavia, Italy, from c.183 until his death, serving for 33 years. He led his see during a turbulent period of persecution and growth. Brother of Saint Leutfridus. Holy Cross Benedictine monk. Known throughout Normandy, France, for his holiness. First century bishop of Iconium. May have been the Terius mentioned by Saint Paul the Apostle in Romans 16:22. Martyr. Sixth century spiritual student of Saint Columba. Appointed abbot of Durrow monastery by Columba. Bishop of Tongres in modern Belgium. Apostle of the Hesbaye district, in Brabant. Monk at Comacchio near Venice, Italy.